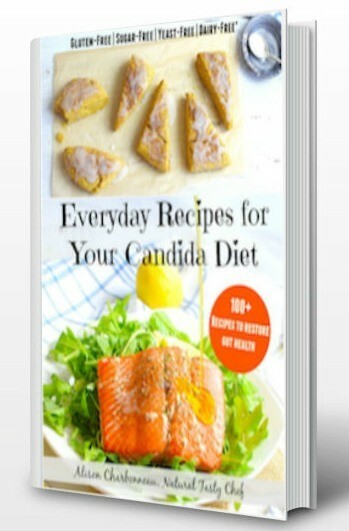 Candida albicans is a yeast, a type of fungus that lives in everyone’s body. Our intestines always have both good and bad bacteria at all times and when these are in balance our gut is happy. Gut health is extremely important since the gut is where our body absorbs nutrients and minerals from the food we eat. If fact, Hippocrates believed that “all disease begins in the gut.” When the balance of our gut bacteria is off, meaning that the bad has overtaken the good, health problems occur. Antibiotics do just that, they kill bacteria, however, they do not discriminate. When taking antibiotics, both good and your bad bacteria get eliminated. This is why it is extremely important to always follow up with good quality probiotics after taking a round of antibiotics to restore gut balance. In fact, it’s a good idea to ALWAYS take Probiotics. I recommend Garden of Life, Raw Probiotics, But there are many good quality probiotics at your favorite health food stores. Best quality will be in the refrigerated section since these are living cultures. Candida feeds on sugar, so naturally a diet high in sugar or foods that break down as sugar (refined flours, pastas, cookies, etc.) and foods high in preservatives and chemicals all create a perfect breeding ground for Candida. Better food options are whole foods, with minimal ingredients and homemade is always best. Avoid refined white sugars and flours when possible and rely more on natural sweeteners and whole grains. Most Birth Control contains contains synthetic forms of two female hormones: estrogen and progestin (a synthetic version of progesterone). These synthetic hormones disrupt your body’s natural balance of estrogen and progesterone, which can lead to yeast overgrowth. Overgrowth occurs when Candida attaches itself to estrogen. This prevents your body from using the estrogen and eventually drives your estrogen levels down. During this time your progesterone levels may increase. This is the perfect condition for Candida and bacteria to flourish, which can lead to a yeast infection. Elevated stress levels can cause yeast overgrowth. When you’re stressed, your body releases more of a hormone called Cortisol. This hormone can weaken the immune system, and at the same time, cause elevated levels of blood sugar. Not only do we consume through our mouths, but also through our skin and our noses. Things like chlorinated water, chemicals, pollution, artificial beauty products such as hair color or nail polish remover, gasoline and cleaning products all lead to weakened gut health.